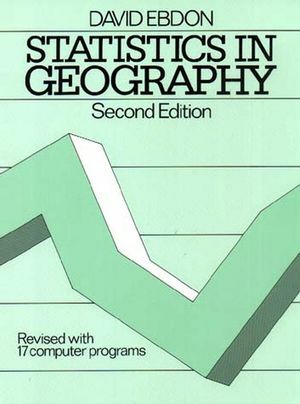 Statistics in Geography has established itself as the best introductory textbook on the subject: the author makes statistical concepts and techniques intellible and their applications in a wide variety of problems comprehensible, even exciting. The main feature of this much-awaited new edition is a set of 17 computer programs (with sample outputs) that cover nearly all the statistical techniques described. These have been carefully written to be user-friendly in an elementary subset of Basic to make them simple to implement on most micro computers. This means students can be more adventurous in their applications and interpretations of statistical techniques. The author has, at the same time, retained all the worked examples in the book so that the reader can gain insight into the logic of the methds by working through them by hand. These, together with problems of various levels of complexity plus comprehensive answers at the back of the book, provide the student with a clear and thorough understanding of both the methods and their potential applications. David Ebdon is Lecturer in Georgraphy at the University of Nottingham. Preface of the Second Edition. Preface of the First Edition. Appendix C: Tables of Critical Values. Appendix F: Notes for Programmers.